Everyone knows that cats secretly invented the intertubes (Al Gore notwithstanding) to convince the world of their cuteness. 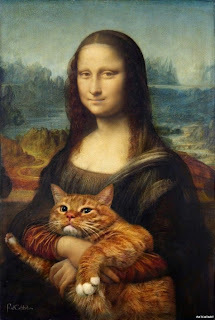 What they're really plotting has yet to be revealed, but we at Brandflakes would like it be known that we, for one, welcome our new feline overlords… In the meantime, it appears they're making inroads into our classic artworks. In this series of abominations from artist Svetlana Petrova, grossly obese tabby Zarathustra defiles forever some of the world's beloved masterworks, once again convincing us that Photoshop is an evil tool.